Winter can be a golden opportunity to explore new ways to keep warm while at the same time building a signature capsule wardrobe. Wearing layers, wrapping yourself in big snuggly sweaters, cozying up with a blanket scarf or donning a statement coat are only some examples of an endless list of possibilities. So yes, contrary to summer when it's too hot to cover up, the cold weather is an opportunity to mix and match in creative and new ways. Yet for me, dressing up for a more festive event—a dinner or a party—when it is cold outside is always a challenge. The days are long gone when I could just ignore the temperature and sacrifice body warmth for appearance. And still, with end of the year celebrations and holidays upon us, I have been wondering about good combinations for a warm yet festive look. While trying to keep up with the latest trends but also standing by my personal preferences, in the few weeks leading up to New Year’s Eve, I would like to explore a few more ideas, in addition to last week’s Discover Why Black, which make me want to dress to party. It only remains for us to transform these theoretical ideas into reality by adopting them as part of our personal style and actually finding the right items out there to add to our wardrobes. Of the combinations I will look at over the next few weeks, the first to explore for an attractive party look could be considered a somewhat unnatural match due to the two very different fabrics used: knitwear on top with silk or satin on bottom. 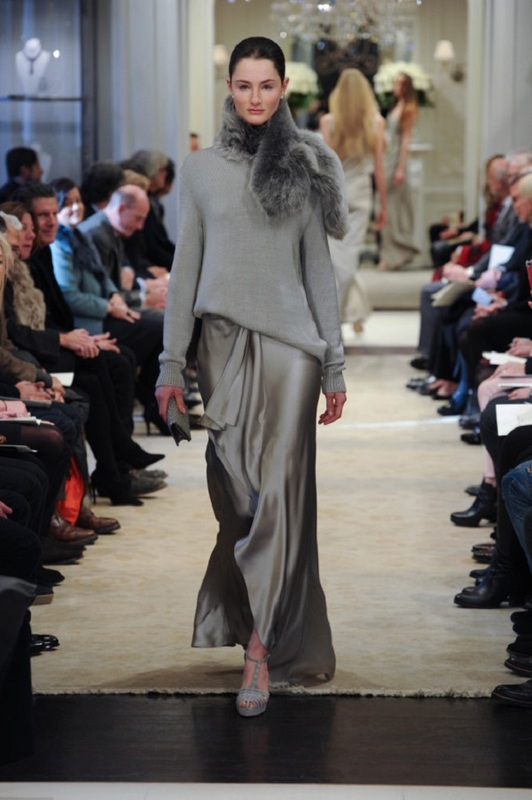 Can we keep warm in a sweater and yet still feel elegant enough for a dinner party?And is a silk or satin skirt suitable for the cold weather? 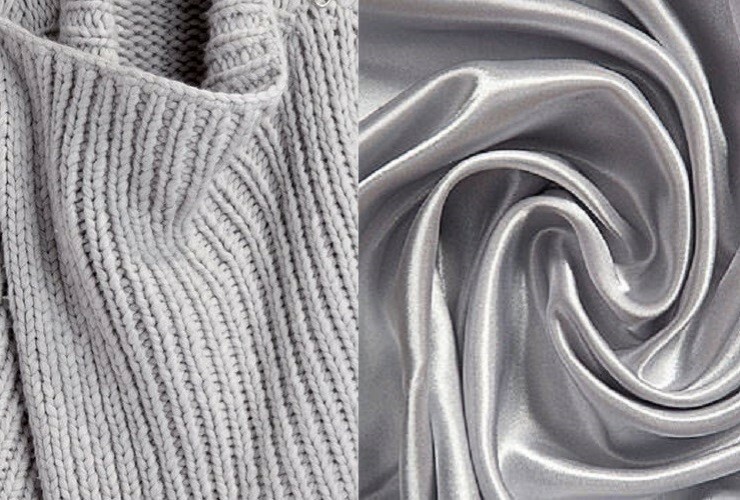 Although silk is more summer oriented, some satin fabrics are thicker and heavier than thin summer silk which makes them a good choice for the colder months. 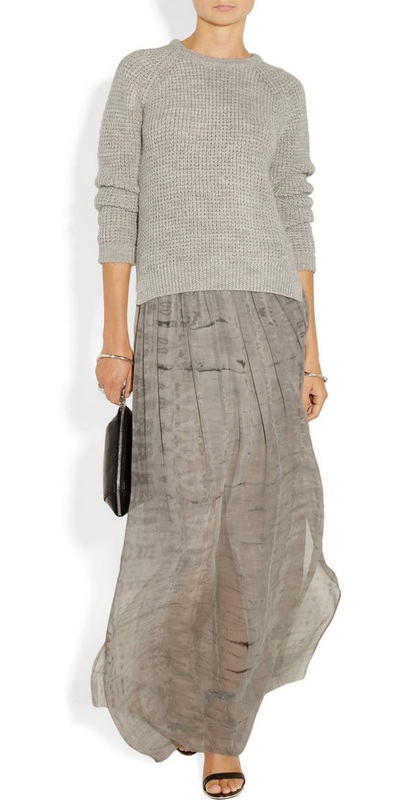 Skirts can, of course, be teamed up with leggings or tights for some added warmth if necessary. Looking at the images above and below, I am certain that you too will find them inspiring. While it may have started out as a great look for a fashion show (we have Ralph Lauren, Jenny Packham and others, to thank this time) and maybe a little excessive for everyday life, these can serve as great inspiration for combining soft with heavy, glossy with matte and easily falling and flaring hems with a large oversized knitted look. Whether gipsy style or a flared, pleated skirt or a wrap, all can be dressed up or down according to their fabrics as well as the top chosen to accompany this glorious ensemble. As you can see, this combination of skirts with knitted tops has been spotted on the street; each fashionista lending it her own more down-to-earth interpretation. Even if you are still debating with yourself whether this is your type of outfit and whether you will feel comfortable enough wearing it, you can nonetheless appreciate the look and the spark of novelty, finding a way to transform these ideas to your own preferences and building your unique signature-style capsule.